The figure shows that the linear trend between 1880 and 2000 is a continuation of recovery from the Little Icea Age (LIA). It shows also the predicted temperature rise by the IPCC after 2000. Another possibility is also shown, in which the recovery from the LIA would continue to 2100, together with the superposed multi-decadal oscillation. This possible progress beyond the peak of an oscillation could explain the halting of the warming after 2000. The observed temperature in 2008 is shown by a red dot with a green arrow. Two natural components of the currently progressing climate change are identified. The first one is an almost linear global temperature increase of about 0.5°C/100 years, which seems to have started in 1800–1850, at least one hundred years before 1946 when manmade CO2 in the atmosphere began to increase rapidly. This 150~200-year-long linear warming trend is likely to be a natural change. One possible cause of this linear increase may be the earth’s continuing recovery from the Little Ice Age (1400~1800); the recovery began in 1800~1850. This trend (0.5°C/100 years) should be subtracted from the temperature data during the last 100 years when estimating the manmade contribution to the present global warming trend. As a result, there is a possibility that only a small fraction of the present warming trend is attributable to the greenhouse effect resulting from human activities. It is also shown that various cryosphere phenomena, including glaciers in many places in the world and sea ice in the Arctic Ocean that had developed during the Little Ice Age, began to recede after 1800 and are still receding; their recession is thus not a recent phenomenon. The second one is oscillatory (positive/negative) changes, which are superposed on the linear change. One of them is the multi-decadal oscillation, which is a natural change. This particular natural change had a positive rate of change of about 0.15°C/10 years from about 1975 (positive from 1910 to 1940, negative from 1940 to 1975), and is thought by the IPCC to be a sure sign of the greenhouse effect of CO2. However, the positive trend from 1975 has stopped after 2000. One possibility of the halting is that after reaching a peak in 2000, the multi-decadal oscillation has begun to overwhelm the linear increase, causing the IPCC prediction to fail as early as the first decade of the 21st century. There is an urgent need to correctly identify natural changes and remove them from the present global warming/cooling trend, in order to accurately and correctly identify the contribution of the manmade greenhouse effect. Only then can the effects of CO2 be studied quantitatively. Arctic research should be able to contribute greatly to this endeavor. Natural components are important and significant in climate change, so they should not be ignored in studying global temperature changes. Two natural changes after 1800–1850 are identified in this paper: an almost linear increase of about +0.5°C/100 years and a multi-decadal oscillation of amplitude 0.2°C and period of 50~60 years superposed on the linear change. The Earth as a whole experienced a relatively cold period, the Little Ice Age (LIA), between 1400 and 1800. The Earth is still recovering from the LIA. It is quite likely that a significant part of the temperature rise after 1975 is due to the multi-decadal oscillation, not the greenhouse effect as hypothesized by the IPCC. The reason why the global warming trend stopped in about 2000 is likely to be due to the fact that after peaking in about 2000, the multi-decadal oscillation has started to have a negative trend. There are other signs of the halting (Figures 10b, 14, and 17 as well as the ocean heat content). The halting is not due to a La Niña. There is nothing unusual or abnormal about the present global warming trend and temperature. There were a number of periods when the temperature was higher than the present even after the recovery from the last Big Ice Age. It is insufficient to study climate change on the basis of data only from 1975. Two examples are presented in which GCM results can be used to identify natural changes due to natural causes. Computers are incorrectly “taught,” “instructed,” or “tuned” to adjust to the observed temperature rise during the last hundred years, and particularly after 1975, ignoring the recovery from the LIA and the multi-decadal oscillation. Thus, the present GCMs do not include processes associated with the LIA and the multi-decadal oscillation. The predicted temperature in 2100 by the IPC is simply an extension of the warming trend between 1975 and 2000. 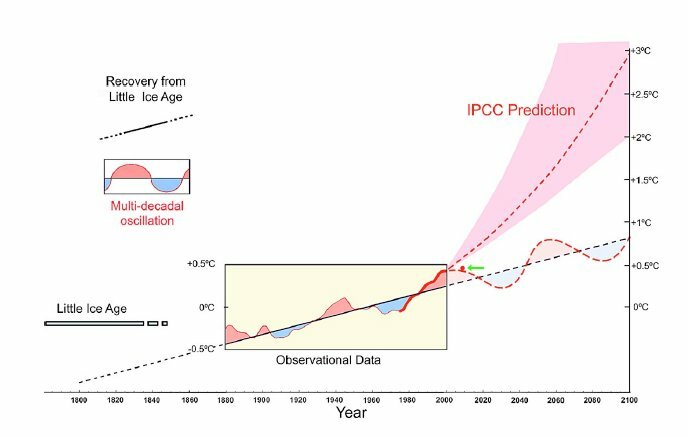 As a result, the IPCC prediction during the first decade of the present century has already failed. If most of the present rise is caused by the recovery from the LIA (a natural component) and if the recovery rate does not change during the next 100 years, the expected temperature rise by 2100 would be 0.5°C. This rough estimate is based on the recovery rate of 0.5°C/100 years during the last 200 years. Multi-decadal oscillation could be either positive or negative in 2100. Since its amplitude change is about 0.2°C, the temperature in 2100 depends greatly on the combination of both effects, 0.5°C ± 0.2°C. More information about Dr Akasofu can be found here. "On the recovery from the Little Ice Age"